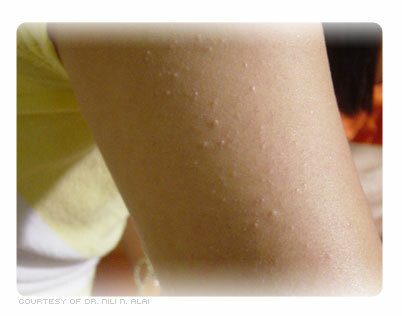 Keratosis Pilaris (“KP”), or chicken skin on the arms as it is commonly known, occurring in one in three adults, and over half of all adolescents. Affected skin is rough and has the appearance of permanent goose bumps. In more than half of the cases it is genetic (inherited), but otherwise the cause is not fully understood. KP occurs when small plugs of dead skin cells (keratin) block the hair follicles, causing an unsightly, rough, spotty appearance. In-growing hairs may also occur in the hair follicle.KP is common on the upper outer arms and thighs but can also affect the face, buttocks, hands or, infact, any part of the body where there are hair follicles. Occasionally the skin can be itchy, but the condition itself is quite harmless. It tends to be worse in the winter months. Treatment is often sought for cosmetic reasons. Avoid heavy creams (which can reduce the skin’s natural exfoliating cycle). Encouraging exfoliation (for example geently using wet exfoliating gloves on the body, or a grainy exfoliator) will improve KP on the body. In the specific case of the eyebrows being affected, loss of hair can occur and sun protection is important. Take fish oils as there is a believe that KP is due to a lack of essential fatty acids.